Adan y Eva was conceived by Carlos Fleitas, president of Cuban Desire Corporation. 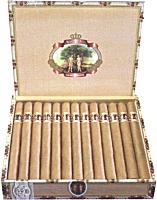 The cigars use five blends of tobacco which are aged for a year in Spanish cedar. Fleitas commissioned well-known Cuban artist, Marti, to create the design and logo for his cigar, which includes a touch of art and history combined with romance. Seven shapes are offered: Panatela (6 x 42), Figurado (4 3/8 x 46), Robusto (7 x 50), Belicoso (5 1/2 x 52), Churchill (7 x 48), Double Corona (7 1/2 x 50), and Piramide (6 3/8 x 50). Suggested retail ranges from $4.80 to $9.20 per cigar, or $120 to $230 per 25-count box. The company is also offering a limited edition 5 x 50 Belicoso and Figurado presented in a 25-count porcelain jar decorated with the Adan y Eva artwork. The cigars are wrapped in African Cameroon leaf. Each jar is numbered and certified and retails for $500; only 5,000 jars are being released. Adan y Eva is currently in limited distribution in the U.S. Cuba Tobacco Trading is the exclusive manufacturer and distributor of this cigar worldwide, and plans to open Europe, Asia, Caribbean, and travel retail worldwide by the end of 2004. Negotiations for Spain and the U.K. are underway. Cuban Desire Corp., Pompano Beach, Fla., Tel: (954) 968-4117, Email: cubancorp@bellsouth.net, Web: www.adanyecigars.com. Heavenly Cigar Company is now offering their most popular cigar, Heavenly Vanilla, in the 5 1/2 x 46 corona size, in a new cedar 10-pack box. Described by company founder and c.e.o. Heather Phillips as "the original and hottest-selling of our existing nine flavors," the Heavenly Vanilla was also the first of Heavenly's flavored cigars to be offered in the Cedar 10-pack format, in the 5 x 30 Petite size. The Coronas, like the Petites, are individually cellophaned in a heavy-walled genuine Spanish cedar box with aesthetically curved symmetry, and priced for keystone markup. Heavenly flavored cigars are made in Santiago, Dominican Republic, all with choice Cuban-seed Dominican filler and binder, as well as Indonesian wrappers. The ornate box and band art are classical in style, indicating a commitment to cigar making tradition. 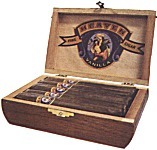 Heavenly Cigar Company, Naples, Fla., Tel: (239) 262-7250, Web: www.heavencigar.com. Mac Baren Tobacco, a well-known name in premium pipe tobacco, is entering the RYO segment with a new line of roll-your-own cigarette tobaccos. The company is introducing two blends in this new product line: Premium Halfzware and an American Blend, both packaged in 40-gram pouches and 200-gram tins. The tins contain premium rolling papers, while the packaging is distinctive and upscale to identify the new RYO blends as a Mac Baren product. Slated to debut at the March 2004 NATO and TAA conventions, the new tobaccos will be available in a pre-packed display to introduce attending retailers to the Mac Baren RYO brand - a cost-effective introduction to the growing Roll-your-own category. Phillips & King International, Moorpark, Calif., Tel: (800) 358-8100. GI Cigar Ordnance cigars, specially-blended and bargain-priced to appeal to cigar smoking military troops, are now available from Felipe Gregorio, Inc.
"We wanted to honor the men and women serving overseas in the United States armed forces," explains Philip Wynne, founder and president of Felipe Gregorio, Inc., "so we have introduced our GI Cigar Ordnance line of handmade 100% long filler premium cigars. We blended and priced the cigars, as well as the designing and presentation, to appeal to our troops and cigar smokers who want to show support for their effort and sacrifice." Packaged in eye-catching camouflage-colored boxes of 25, and sporting bands that boldly state "GI Cigar Ordnance" and "Victory Smokes," the cigars are manufactured in the Dominican Republic, with Piloto Cubano filler, olor binder, and a Sumatran wrapper. The blend emphasizes mild to medium-bodied flavors for younger cigar palates. Three simply designated sizes are available: Medium (5 x 50); Large (6 x 50); and "X Large" (7 x 50). The pricing - between $2 and $3.50 at keystone, is designed to be easy on military budgets. Felipe Gregorio, Inc., Alexandria, VA, Toll-free: (800) 336-1181, Fax: (703) 519-7323. Web: www.felipegregorio.com. Following the introduction last year of the Oliveros Classic Collection with an African Cameroon wrapper, Habana Cuba Cigar Co. is now extending the line with a new version, available with a Brazilian maduro wrapper. Using a blend of Nicaraguan and Dominican tobaccos, the Maduro is a slightly fuller bodied blend than its Cameroon cousin. Both wrappers are available in three sizes: Toro, Churchill, and Torpedo. Distinctive packaging sets this line apart from others, as well as a very friendly price point - suggested retail $3.84-$4.00. Each cedar box of 20 cigars comes in its own burlap sack. In addition, Oliveros Flavors, well known for its top-quality long filler premium flavored cigars, has extended its popular Long Lady size (5 x 36) with a new flavor - Irish Cream. 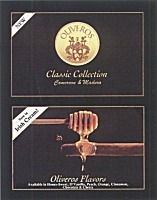 The Oliveros Flavors are made by blending imported wines, molasses, and honey with premium, long filler, Cuban-seed Dominican tobacco. Irish Cream joins the existing flavors, including Honey-Sweet, Vanilla, Chocolate, Cinnamon, Peach, Cherry, and Orange. The Long Lady suggested retail is $3.40 per cigar. Habana Cuba Cigar Company, Miami Lakes, Fla., Tel: (305) 557-6919, Fax: (305) 557-2219. HBI Tobacco has launched Rollies Hemp Cigarette Papers, premium hemp papers featuring three unique, stylish package designs created to stimulate repeat sales. The manufacturer is offering promotional merchandising to generate immediate brand awareness, and supporting the new line with national advertising and a promotional campaign. Rollies are available in 1.0, 1 1/4, 1 1/2, and King Size formats. HBI Tobacco, Phoenix, Az, Tel: (866) 420-4372, Web: www.hbiinternational.com. Chancellor Tobacco Company, LTD has released the Treasurer Luxury White, a more affordable follow-up to their ultra-premium Treasurer flagship brand, which launched in 1999 at a retail of $25 per pack. Luxury White is a chemical-free mixture of fine Virginia tobaccos, with a clean, smooth flavor, priced at around $7.00 retail, packed in clamshell boxes. Phillips & King International, Moorpark, Calif., Tel: (805) 531-8888, Fax: (805) 531-8899. Bucanero Cigars has introduced the Don Douglas Cabinet Series, a handmade cigar honoring Master Blender Don Douglas Pueringer, who retired from the cigar business in 2002. The cigar's blend is composed of aged Ecuadorian, Dominican, and Nicaraguan tobaccos, which impart a subtle natural sweetness, full aroma, and long aftertaste. The Don Douglas Cabinet Series is made at Tabacalera Tambor in Esteli, Nicaragua, and is available in three sizes: Churchill (6 7/8 x 48), Belicoso (6 x 54), and Robusto (5 x 50). The cigars are packaged in 12-count wooden boxes. Bucanero Cigar Company, Tampa, Fla., Tel: (813) 251-4137, Web: www.bucanerocigars.com. Horizon Cigar, a European company started by John Atherton and Richard Laing, two former executives of General Cigar, is bringing its products to U.S. consumers, the first through a distribution deal with Alec Bradley Cigar Company. Del Campo is a premium cigar with a filler blend of Nicaraguan, Mexican, and Honduran tobaccos, Sumatra binder, and a Havana Criollo wrapper, packaged in boxes of 24. Del Campo is made in four sizes: Churchill (6 3/4 x 48), Torpedo (6 1/4 x 52), Robusto (5 x 50), and Corona (5 1/2 x 42). La Rica, a brand that has established a foothold in Germany, Switzerland, Italy, the U.K., and other European nations, is slated for a trial run in the U.S., with the company currently seeking a distributor. La Rica has a Nicaraguan filler blend and Ecuadorian wrapper, and is available in three sizes: Corona (5 1/2 x 40), Robusto (5 x 50), and Churchill (6 3/4 x 48), each packaged in a cedar-lined aluminum tube. For information on La Rica, contact sales@horizoncigar.com. All of Horizon's brands are manufactured at the factory of Carlos Tora�o - Latin Cigars de Nicaragua S.A. - in Esteli, Nicaragua. Alec Bradley Cigar Co., Plantation, Fla., Tel: (954) 321-5991, Fax: (954) 321-9968.